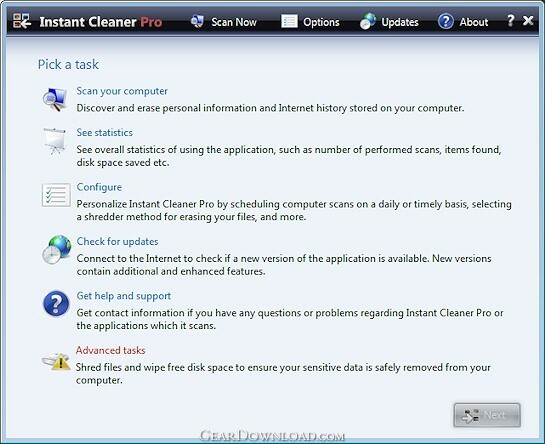 Clean your PC history & protect your privacy - with Instant Cleaner Pro, FREE! Did you know that your computer SECRETLY tracks all of your activities? Every website you visit. Every e-mail you send. Every document you open. It's all secretly tracked and logged inside the thousands of history files kept on your PC. Instant Cleaner Pro can safely erase ALL of the history files on your computer, leaving everything as-new. Remember, simply deleting your browser history does NOT clear everything! Protect your privacy TODAY. Download Instant Cleaner Pro! Limitations: Fully-functional for a trial period. This download (trialversion.exe) was tested thoroughly and was found 100% clean. Click "Report Spyware" link on the top if you found this software contains any form of malware, including but not limited to: spyware, viruses, trojans and backdoors.